This 5-storey low energy mixed-use development was designed in 2007 - 2008, as we were developing our Passive House approach and completed in 2014 after it was put on hold during the economic recession of the intervening years. 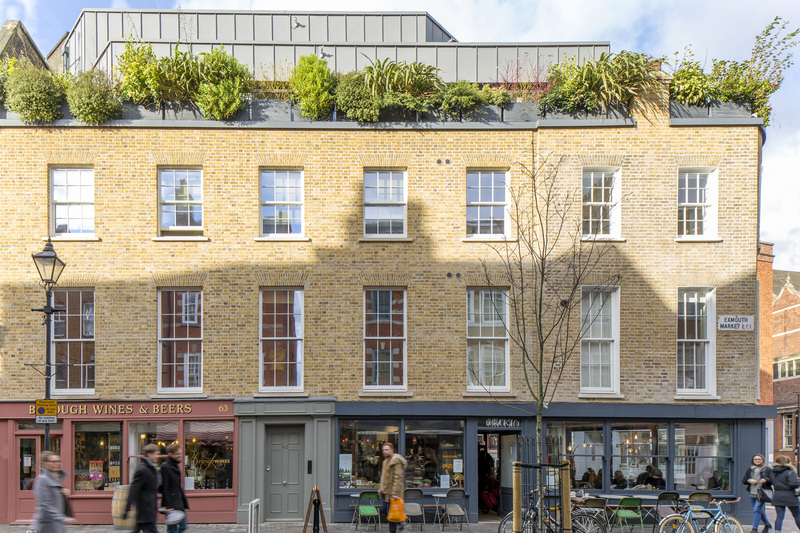 This 5-storey mixed-use development transformed the north end of Exmouth Market from a run-down collection of shabby buildings that was previously suffering severe subsidence, making this the most desirable and popular end of Exmouth Market for both the commercial and domestic property sectors. We managed to significantly increase the quantity, quality and value of the property on this site, persuading Islington Council to accept a much larger building than they had originally anticipated, including the effective demolition of the existing run-down buildings apart from some façade retention, mainly on the Tysoe Street elevation. 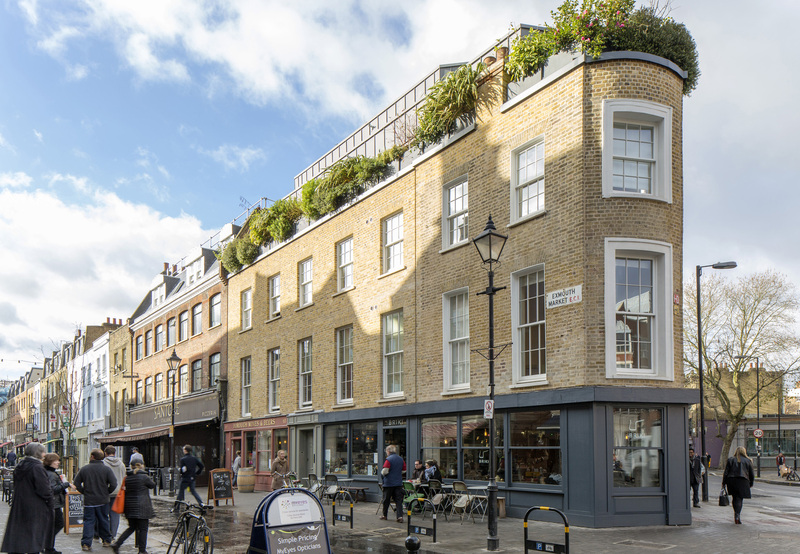 The new Exmouth Market elevation consists of traditionally bonded London stock brickwork set in a gritty, wire-brushed lime mortar. The two-storey penthouse at the top of the development is clad in zinc. Fastidious specification and detailing of the brickwork facades contributes strongly to the enhancement of the public realm, and has been praised by Islington Planning Department, who tell us that they now provide our specification to other architects. With a planning requirement for traditional sash windows, the development could never have achieved full Passive House performance, but the building will be comfortable, healthy and economical. We were successful in turning the council around from single glazing to triple glazed traditional sashes on first and second floor domestic accommodation and contemporary triple glazed windows in the penthouse. All the brickwork is internally insulated and thermally broken, and on testing, the building was found to have excellent air-tightness, although not to the PH standard. This building shows how a developer can build healthy, comfortable, economical buildings that meet current conservation area planning requirements, enhancing their portfolio value, while also playing a part in looking after the environment and the interests of future generations.